During the 2013 East Austin Studio Tour, Salvador Castillo brought back the 4th annual “Eyes Got It!” competition. This Austin-spun event featured a panel of local arts professionals offering critiques of artists’ work in front of a live audience. 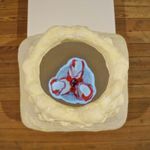 After three rounds of increasingly tougher critiques, a winner was announced and Gracelee Lawrence was awarded a solo exhibition at grayDUCK. 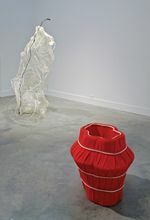 We are proud to feature Gracelee Lawrence and her performance-based video, abstract sculpture and generative drawings. 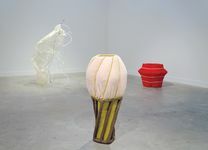 With all three mediums she shows a range of work that spans different thought processes about consumption and community. 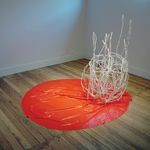 Gracelee Lawrence presents Mouthfeel, a series of drawings, sculptures and video works where the theme of nourishment and its relationship to gender, sexuality and ritual is explored. 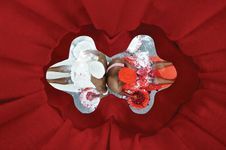 In her video works, Lawrence combines object making with performance-based documentation, reorienting the viewer’s physical relationship to the act of viewing. 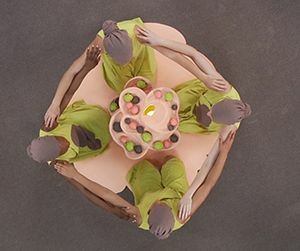 The videos feature images of costumed performers interacting with food where rituals of cooking, sharing, and consuming pose questions about necessity and excess relative to nourishment and community. Food is shown as a self-inflicted duality of sustenance and excess, reward and punishment. Lawrence’s sculptures are generated by abstracting phrases plucked from historical fiction relating to women’s emotional experiences. Rendered unreadable by twisting and contorting these texts in three dimensions, Lawrence visually questions legibility and direct communication. Lawrence’s generative drawings, unhindered by the constraints of physical reality, are formulated from such varied sources as internal anatomy schematics, diagramed ideas for future performative actions, and abstracted scenes or objects. 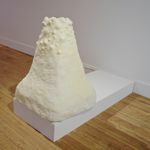 Similar to her sculptures, these largely abstract works are not conclusive but act as directed catalysts, where metaphors for consuming, ingestion, digestion, sexual contact, sustenance and community abound.